It’s time to break out a riot of color to show you some inspiration for decorating with bright pink! My last post was about Decorating with Light Pink so now we will ramp up the color level and show that although decorating with bright pink needs some thought, it is actually adaptable for many different spaces and styles of home decor. Let’s start with the maximum wow factor! 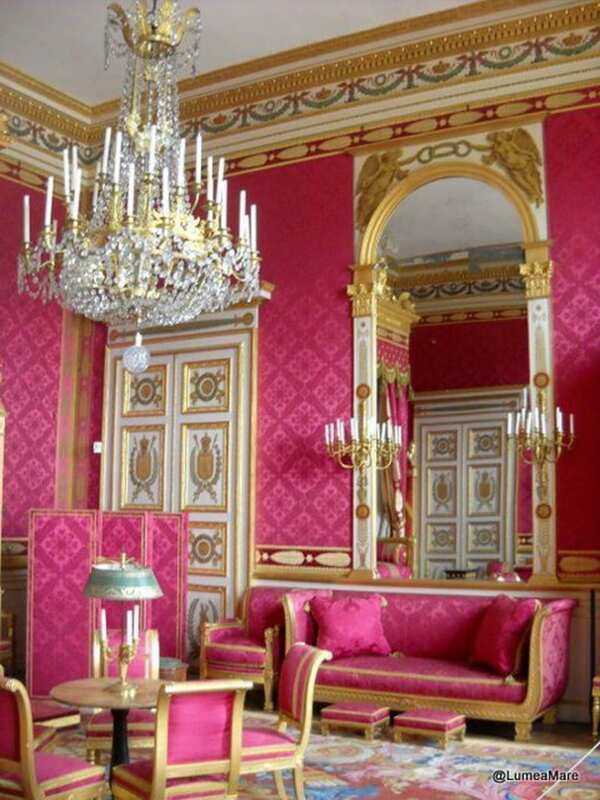 This bright pink and gold room is in the Palais de Compiègne about 50 miles from Paris. The royal and imperial palace was built by Louis XV and Louis XVI, and remodeled by both Napoleon I and Napoleon III. None of those guys was shy about showing off and the Palais de Compiègne was a center of power and court life. Although the decor here is probably too extravagant for most of us — and who has such high ceilings and amazing architectural details anyway? 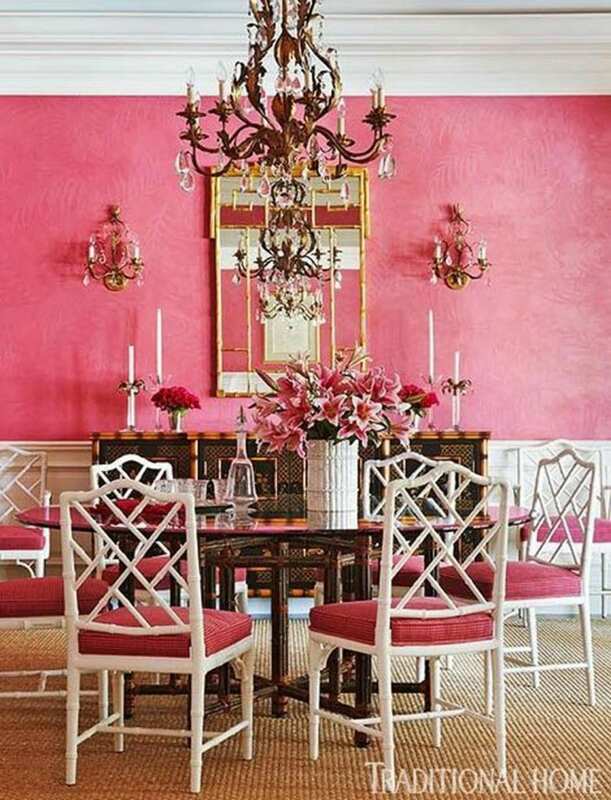 — there are some lessons to be learned about decorating with bright pink from this classic room. First, the tidy, formal symmetry helps contain the exuberance of the color. The gold and the white also punctuates the color to give it form. The pattern on the upholstery also breaks up the solid color a little. Here’s the updated 21st century version of that look! This photo from Traditional Home magazine shows how you can translate the French palace grandeur to your own home. It shows designer Robin Weiss and husband Bill’s Palm Beach vacation home. You’ll notice the same sense of symmetry as the French palace and the same use of white and gold, although with a greater emphasis on white rather than gold. This gives a lovely fresh look while still keeping the nobility with the gold mirror. There is also an ornate chandelier and two wall candelabra, which are important to show that yes, we really do want a sense of flamboyance! With this much bright pink, you don’t want to pull your punches or try to squash the energy by playing safe with too small or too ordinary light fittings. The textured floor covering helps ground it all too, and it adds a contemporary touch. 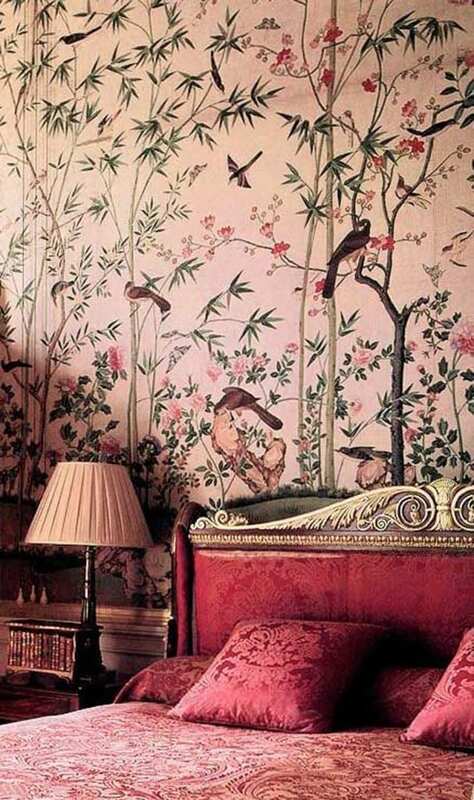 Another way to use strong pinks is in textiles and in decorative wallpaper. This photo shows the Leicester Room at Chatsworth House in England, home to the Duke and Duchess of Devonshire, and passed down through 16 generations of the Cavendish family. The 1830s Chinese paper on the walls shows how a fairly bright pink can look fabulous when it has a surface design on it to break up the color intensity. 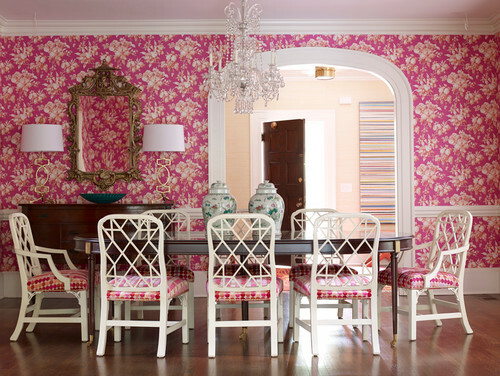 Here’s the 21st century version, showing how to update the strong pink wallpaper look. The Balata wallpaper in this dining room in Boston is accented by white, gold and a crystal chandelier. This combo always helps lighten up the intensity of a deep pink while keeping true to the spirit of the color! If you want to try using bright pink in a more restrained way, check out this gorgeous home in Atlanta which uses a bold pink textured wall covering as a feature wall. The color on the far wall creates depth and visual interest for this room, which might otherwise seem rather one-dimensional, despite the many patterned surfaces. Again, white and gold are the major colors paired with the pink, so I think we are getting some good pointers about smart ways to plan our bright pink decor! 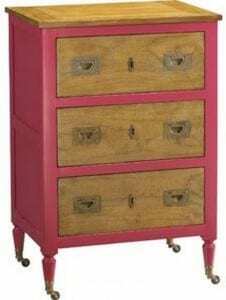 Another easy way to add bright pink is with accent furniture, such as this lovely new French Heritage pink nightstand. The maple bedside table or 3-drawer chest has brass handles and cute castors to make it easy to move around. The strong raspberry pink trim on the nightstand makes it stand out and add a dash of color to a bedroom. Have you decorated with bright pink in your home? We’d love to see photographs or hear how you use this gorgeous and uplifting shade! Aimee owns EuroLuxHome.com with her husband and best friend, Greg. Aimee sources amazing antique furniture, vintage lighting, & high-quality reproduction furniture to help her customers decorate their homes in a unique way. She loves her 7 (you read that right) fuzzy children and is renovating a 1920s bungalow in South Carolina. Find us on Facebook or connect with EuroLux on Google+. Or you can sign up here to receive this blog in your inbox. This entry was posted in Home Design Ideas and tagged bedroom decor, creative home decorating, decor, decorating, decorating with pink, dining room, French Heritage, interior decor, interior design, living room decor on June 28, 2018 by admin. I’ve been seeing a lot about decorating with pink this summer. Sometimes people can be wary of decorating with pink because they fear it might look too girly or sugary, but in fact pink is an incredibly versatile shade that can be used in lots of sophisticated ways. Whether you like the subtlety of ballet slipper pink or the elegance of rose, the softness of blush or a rich jolt of fuchsia, I’ve found some ideas to inspire you. In this first blog post I’m going to focus on decorating with light pink. Next time I’ll look at the livelier bright pinks! 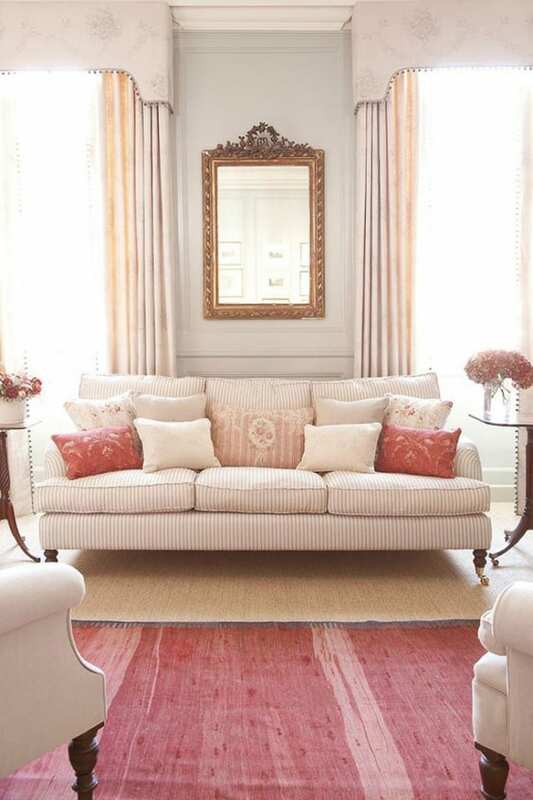 To prove just how elegant and yet comfortable pink can be, here’s a wonderful Country style living room with textiles by UK textile designer Kate Forman. She’s got the English country charm completely sewn up! 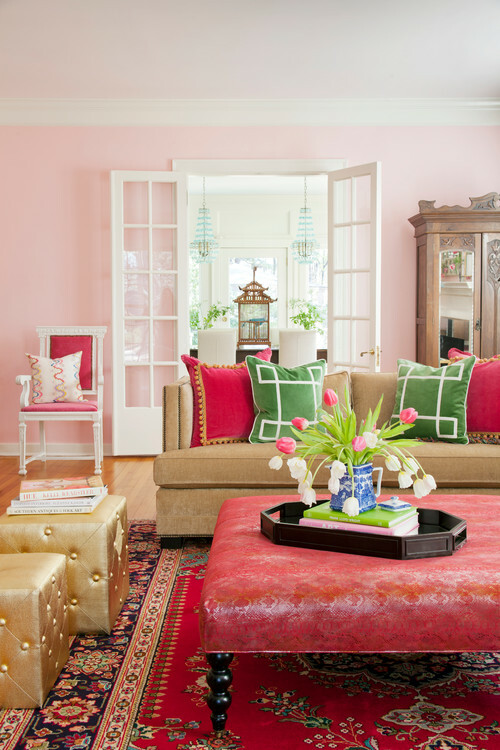 Notice the pink ticking upholstery on the sofa and how it echoes the linear design in the rug and even the folds in the drapes, providing a sense of structure that makes this pink look very grown-up! Then Forman layers different prints in the cushions in a way that gently softens this quite formal space. Black works brilliantly with a soft pink, including the slightly grayed out tones of the fashionable Millennial pink. As you can see from the otherwise quite traditional Farmhouse style bedroom in Boston, the black gives an edge to the pink and grounds it, removing any hint of saccharine sweetness and keeping the whole look fresh. The black chair and sharp angles of the graphic black frames also ground this pink living room in Atlanta, which looks a little like a sitting corner in a French boudoir to me, it is so inviting and arty! The pink chandelier really sets this space off. 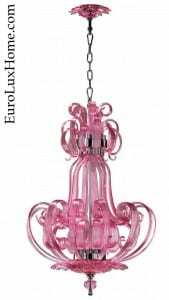 It’s a little like some of the pink chandeliers we have for sale on our website, including this nice new Cyan Design new Cyan Design Florence chandelier crafted in Murano glass style with cascading swirls. Stepping up the color voltage a little, the living room cleverly mixes a soft pretty pink on the walls with darker tones of pink and pinky red to create a lot of depth and texture. 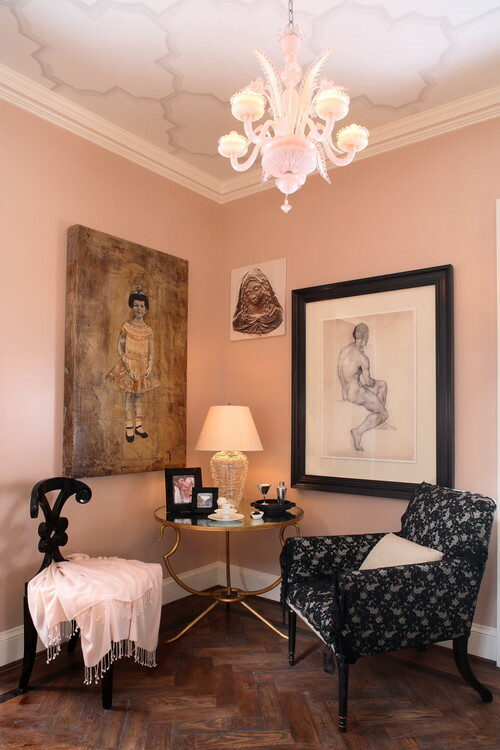 The eclectic feel of the room is wonderful and feminine and if you like that pink on the walls it is Sherwin Williams Paint Color Bella Pink. The pink is offset by green cushions, which is a classic color combination and you often see pink and green together in Art Deco design. Decorating with pink can be a short cut to setting a romantic mood, as in this delightful pink bathroom. I think I might add a few more fresh flowers or a large plant in the corner, but the pink tub and the handsome fireplace already set establish a romantic Old World mood. 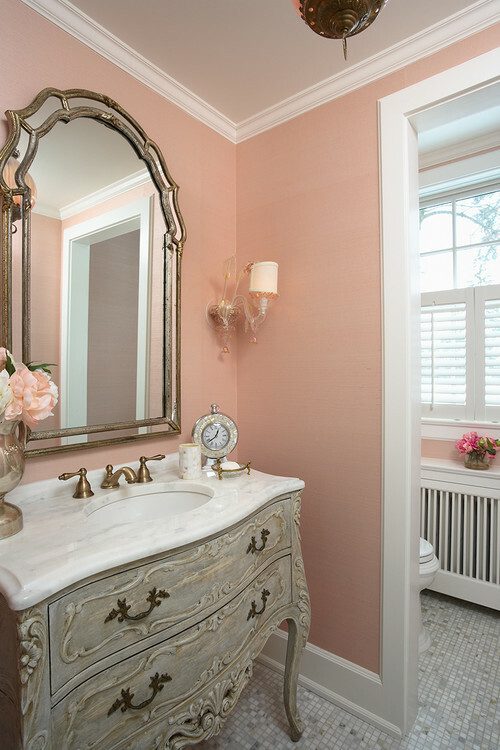 The ballet slipper pink wallpaper by Ralph Lauren also evokes an elegant turn of the century feel in the in the powder room of this Victorian home in Minneapolis. I’d probably want to choose a slightly larger wall sconce with a bit more decorative impact, but the overall impression is serene and graceful. I hope that this post about light pinks has got you “in the pink” about decorating with pink. In my next post I’ll show you some bright pink decor schemes and how to update the classic bright pinks for today’s homes! This entry was posted in Home Design Ideas and tagged Bathroom, creative home decorating, Cyan Design, decor, decorating, decorating with pink, interior decor, interior design, living room decor, Master Bedroom Suite on June 28, 2018 by admin. I’ve got French style on my mind because our latest container full of antique furniture just left Europe to travel to the USA! It’s due to arrive around Thanksgiving so we’ll have a lot of new inventory of French antiques and vintage home decor soon in our online gallery at EuroLuxHome.com. I’m so looking forward to the arrival of the pieces we are bringing across the Atlantic for you, I’ve found some new books that are all about French style at home. If you’re in the mood for some serious opulence, take a tour of the grand homes in Private Houses of France: Living with History. 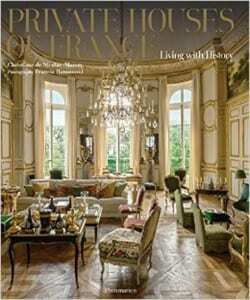 The houses and castles featured in the book all illustrate important periods in the history of French decor. The fashion designer Givenchy’s Parisian townhouse is designed in the style of Napoleon III. The fabulous Château de Champchevrier pulls out the stops with the regal French Hunting style. Our customers who love Renaissance style will enjoy the allure of Château d’Anet, where King Henry II and Diane de Poitiers had their romantic trysts. Other readers will be swept away by the beauty of a Parisian manor house… sigh! 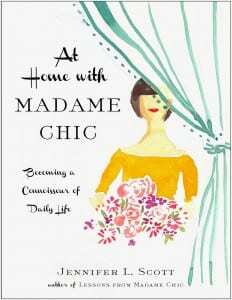 At Home with Madame Chic: Becoming a Connoisseur of Daily Life talks about the effortless style and small comfortable details that make home a wonderful place to be every day. I hope you enjoy reading and taking some French style inspiration. If you have a tip on how to create French style at home, please do tell us in the comments! This entry was posted in Bookshelf and tagged books, creative home decorating, decor, decorating, decorating books, design books, design inspiration, European Antiques, French, home decor, interior decor, interior decorating resources, interior design, interior design books, Old World style on November 4, 2014 by admin. Eclectic Decor: Freedom from Matchy-Matchy Furniture! Our customers enjoy eclectic decor and so do we. “I don’t want things that are matchy-matchy,” they say to me. They don’t want Rooms-To-Go! I love chatting with people who have the confidence to just pick things they are drawn to. I always say: “If you see something you like, get it!” Don’t worry about everything matching in a room. It will come together if you trust your taste. That takes courage and boldness, but I like things to look unique and I also like the juxtaposition of different styles, color tones, and wood styles. Rick and Cheri’s dining room is a great example. We took a tour of their home in our Antique Carved Furniture Fusion Client Spotlight. 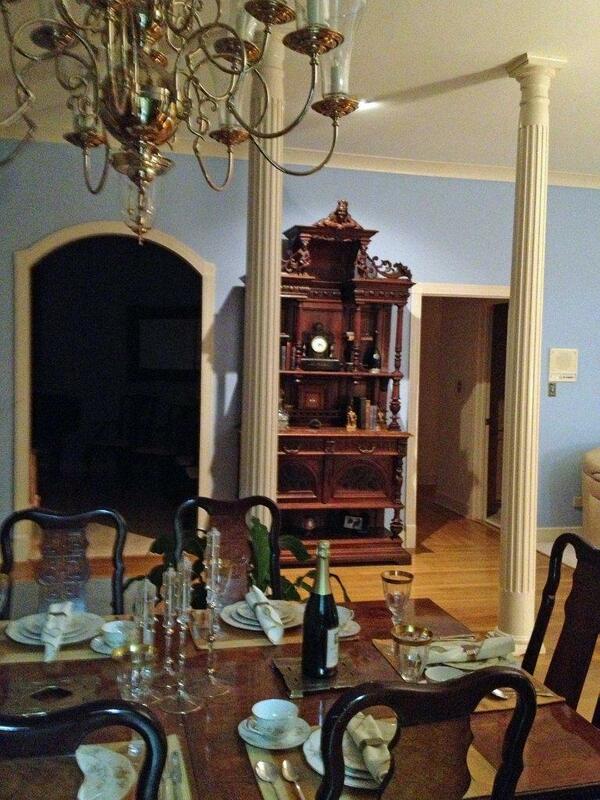 Rick and Cheri purchased several pieces from us over the years, including the 1900 French Renaissance buffet pictured here. But they also bought antique furniture in the French Hunting style, the Flemish Mechelen style, the American Eastlake style, and the French Brittany style! All the pieces are beautifully carved and they create a wonderful (and very individual) fusion. Many of our customers are interested in having chairs that don’t exactly match. This graceful eclectic decor dining area shows how interesting it is to have a mix of seating and upholstery fabrics. The two antique chairs don’t match, but they complement each other with their traditional French styling. The sofa looks more modern but still classic, and the shaping of the back means that it blends nicely with the antiques. With the pretty mix of fabric prints and the fancy chandelier, this space looks charming! This entry foyer is another great example of eclectic decor. The space is so inviting I’d be tempted to stop here and go no further! This house is filled with antiques in different styles. Although the comfy old chair looks quite French in style, there are also nomadic African influences in the carpet and the display of pottery. This bedroom is unusual. At first glance it has an antique French look to it, in the sofa, chair, and console table. The pale blue sofa upholstery coloring is also typical of antique French decor and the sculptures are very Old World classic. But look closer and you’ll notice that the two small tables before the sofa have a square geometric design that looks quite modern. The rectangular table lamp, blingy chandelier, and the simple, almost Scandinavian four-poster bed are also not in keeping with the period and style of the other furniture. But doesn’t it all come together to set a lovely scene in this bedroom? The last three photos in this post come from Houzz, and we’re delighted to say that we have been invited by Houzz to join their marketplace! You can find our furniture and home accents at EuroLuxHome on Houzz and check out our 5 Star reviews. Of course, you can still browse our full inventory at our own online gallery site: EuroLuxAntiques.com. 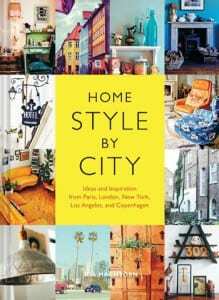 Tell us your tips on how you create unique and eclectic decor in your home! Aimee owns EuroLuxAntiques.com with her best friend, Greg. Aimee sources amazing antique furniture, vintage lighting, & high-quality reproduction furniture to help her customers decorate their homes in a unique way. She loves her 8 (you read that right) fuzzy children and is renovating a 1920s bungalow in South Carolina. Find us on Facebook or connect with Aimee on Google+ Or you can sign up here to receive this blog in your inbox. This entry was posted in Antique Furniture, Home Design Ideas and tagged antique furnishings, Antique Furniture, bedroom decor, creative home decorating, decorating, decorating with antiques, design ideas, dining room, Eclectic, foyer decor, home decorating, interior decor, interior decorating websites, interior design, living with antiques on June 5, 2014 by admin. 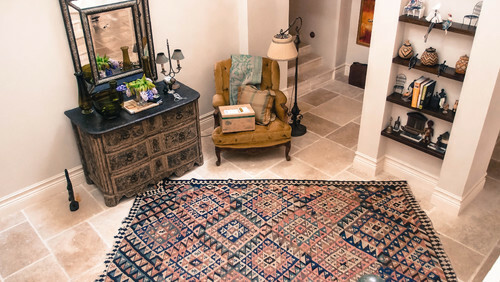 One of the things we love about living with antiques is their versatility within any decor. Take an antique dining table. You can dress it up with fancy linens for a classic look — or leave the wood bare for a more modern look. 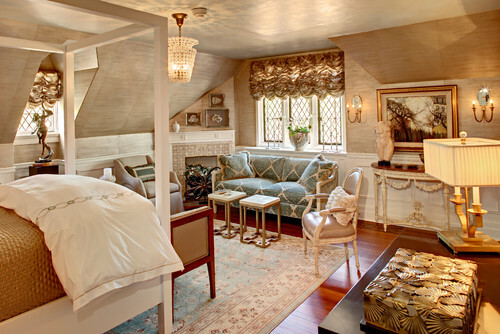 You can create a shabby design scheme with your antiques, or you use them to go upscale. When decorating with antiques, your personal taste eclipses the objects themselves. Here are three distinctive ways to dress up (or down) your decor for Thanksgiving. If you love a luxurious look, think color and texture. A thick, ivory damask tablecloth laid over an antique dining table creates a drape-y textural effect, while its color contrasts nicely with the warm wood tones of the chairs. Likewise, a neutral table cover offers the perfect backdrop to showcase a beautiful floral centerpiece in hues of orange and yellow, green and brown. The colors of fall will set a traditional tone for your holiday meal, and the varied textures of floral petals, waxy leaves, or spiky miniature cattails will serve as a counterpoint to the softness of the linens. The opulent look also requires using heirloom china and sterling flatware. Choose simple, white plates to showcase the food, or go for ornate antique plates that may have been used during the Victorian era. Cut crystal (or glass) goblets and weighty silver flatware add a sense of specialness to the event. It’s perfectly possible to incorporate antiques into modern designs, especially if you use antique accent pieces to ground and balance your contemporary space. Try using a solid color linen tablecloth and contemporary place settings for a modern feel. Then add vintage pewter candlesticks, salt cellars (or tiny vintage salt and pepper shaker sets), and antique silver-plated flatware to convey a traditional sensibility in your design. Add a touch of fun by finding flatware with real or faux horn, antler or Bakelite handles to add interesting texture to your tabletop. Using cherished heirloom glassware, linens, and accessories offers a nod to family history as relatives gather around the table. Sometimes, the most memorable holidays are the least fussy ones. If you don’t have the time, energy, or budget to put on a Thanksgiving extravaganza, you can still enjoy the simple pleasures of good food shared with family and friends. A simple, reproduction farmhouse table sans tablecloth can serve as the ideal backdrop for your scaled-down holiday celebration. Set out vintage transferware plates for a nostalgic feel. Make a simple centerpiece by carving a pumpkin or by using old milk bottles in their original holder to arrange flower stems cut from your own backyard. Create a single, showstopping focal point by embellishing your chic, shabby chandelier with teacups tied with ribbons or pinecones hung with fishing line. In the end, Thanksgiving is about expressing gratitude for the richness of life. Whether you choose to celebrate lavishly with family and friends or reflect quietly with only your significant other, you can use your antiques to help create a memorable holiday that suits your unique tastes. This entry was posted in Holiday Fun, Home Design Ideas and tagged 2012, contemporary decor, decor, decorating, decorating with antiques, holiday decorating, holiday table, living with antiques, modern decor, table setting, Thanksgiving, Thanksgiving table on November 8, 2012 by euroluxantiques.